“In my experience, there’s no such thing as luck." 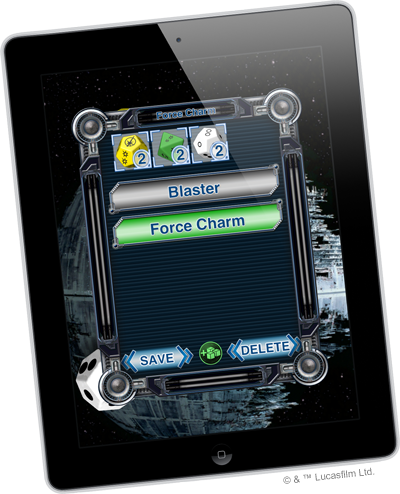 Master fate in your favorite FFG Star Wars™-themed game with the Star Wars Dice app for your iOS or Android device! The ultimate accessory for the X-Wing™ Miniatures Game, Imperial Assault, Star Wars: Armada, and the Star Wars® Roleplaying Game, this comprehensive application allows you to quickly and conveniently select and roll custom dice, and even includes an assortment of standard dice for all your gaming needs. In the X-Wing Miniatures Game, custom eight-sided dice determine the outcome of exciting dogfights. With symbols for hits, critical hits, evasions, and focusing, these red and green dice intuitively convey everything players need to know to keep the action tense and the battles cinematic. Star Wars: Armada uses a similar system to determine the outcome of devastating capital ship salvos, and Imperial Assault uses dice to determine every blaster shot, lightsaber strike, and lucky dodge. Meanwhile, the seven unique custom dice in the Star Wars Roleplaying Game are designed to seamlessly supplement your narrative, offering a range of storytelling options with each and every roll. Ability, Proficiency, and Boost dice provide beneficial symbols, while Difficulty, Challenge, and Setback dice provide negative symbols. These dice, along with special Force dice for determining the enigmatic flow of destiny, help weave rich and cinematic narratives. With its convenient radial menu, the Star Wars Dice app allows you to roll up to twenty of these dice in any combination, and even includes standard polyhedral dice in seven types! This means that even when you’re not playing a Star Wars game, the Star Wars Dice app is the only dice roller you’ll ever need. What’s more, you can even pre-set your own dice combinations, saving and naming them for future use. Do you have a favorite blaster your character always uses in Star Wars: Edge of the Empire? Select its dice, use the “preset” option from the radial menu, and name your selection something like “Blaster.” You’ll be able to quickly draw your trusty weapon whenever your character needs it. 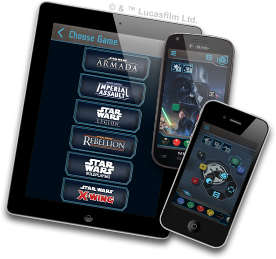 In addition to its unique dice types (two from X-Wing, three from Star Wars: Armada, six from Imperial Assault, seven from Star Wars RPG, and seven standard polyhedral dice), the Star Wars Dice app features a range of options for audio and visual customization. Cinematic backgrounds let you roll your dice against a range of iconic Star Wars scenes. Show your allegiance with the Rebel or Imperial faction symbols, or adorn your app with portraits of Boba Fett or Luke Skywalker. You can even commemorate one of the greatest duels in Star Wars history with a dramatic clash between Darth Vader and Obi-Wan Kenobi, or display the might of the Empire with a massive Star Destroyer or the chilling Death Star itself. Even the Dice app’s sound effects can be customized to reflect your individual preferences. Six distinct sound effect settings let you immerse yourself in the action. With the “Jedi” sound setting, for example, you’ll hear the swinging and clashing of lightsabers with each roll, as Obi-Wan offers words of wisdom and encouragement. Or with the included “Rebel” sound suite, blaster fire accompanies your rolls. Whichever sounds you choose, they'll bring you directly into the excitement of the Star Wars saga. When the fate of the galaxy depends on the outcome of your next roll, you don’t want to wait. 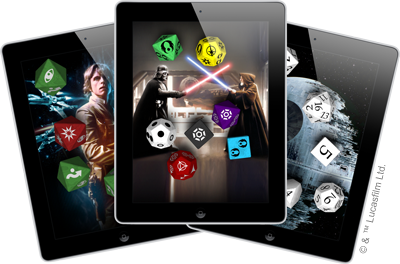 Head to the App Store or the Google Play Store, and download the Star Wars Dice app today! Watch this space for content related to the Star Wars™ Dice App.